The character of Carmen as originally imagined by Mérimée was a feisty, brazen woman who defied stereotypes of how a 19th century woman was supposed to behave. And as the opera Carmen grew in popularity, the character of Carmen—imbued by Bizet with the mystic and eroticism of gypsy culture—only fueled the Gypsy Mystique. While in historic gypsy culture, women filled traditional roles of mother and caretaker, Carmen is portrayed as a strong independent working woman who uses her sexuality as her power. It is important to note, however that she is not a prostitute. While independent, she is also has a community: her tight-knit group of friends who look out for her. As portrayed in the story, Carmen is both working-class and exotic, and comes from a minority culture. Bizet portrayed her character through his opera score as he mixed mainstream, Romantic-era symphonic musical convention with the exotic melodies he heard on the Paris streets and in nightclubs—popular and folk melodies—as he frequented the many shady haunts of bohemian and red light districts. “Habanera” performed by Anna Caterina Antonacci in a Royal Opera House Production of Carmen, 2015. In the nearly century and a half since Bizet’s controversial opera debuted, many have adapted the opera, updating elements to serve contemporary audiences. Of these, adaptations included a 1944 musical by Oscar Hammerstein, Carmen Jones, later adapted for film; a few additional film versions in the early 1980s; and MTV’s 2001 made-for-tv “hip-hopera” Carmen, starring a 19-year-old Beyoncé Knowles. The hip-hopera was an adaptation inspired by both Bizet’s and Hammerstein’s versions, featuring an entirely new hip-hop and R&B score by Kip Collins. In this version, Carmen is portrayed not so much as a rebel, and more of a girly-girl who dreams of being an actress and whose life centers on partying and boys. This simplification ends up depriving Carmen of some of her agency as a strong female character. At the time, Beyoncé was the strongest voice in Destiny’s Child, who had just released the song “Independent Women,” for the film soundtrack of Charlie’s Angels (2000). 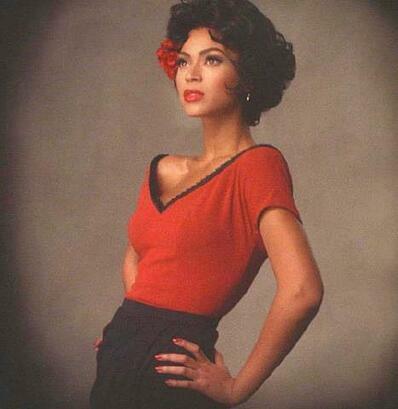 Although her portrayal of Carmen in the hip-hopera was perhaps two-dimensional, in real life Beyoncé’s professional persona, more closely resembled Bizet’s or even Mérimée’s Carmen. Her song lyrics address themes of independence and feminism, and her performances highlight her sexuality. Beyoncé has also been exoticised by fans in part due to her mixed ethnic and socioeconomic background. Perhaps even Beyoncé’s portrayal of Carmen early in her career influenced her artistic sensibility toward cinematic storytelling through music; informing subsequent albums, concert performances, further film appearances, and most recently, a visual album. All elements that have clear contemporary parallels to opera as an art-form. In the last fifteen years, Beyoncé has gone on to produce many albums addressing themes that are personal to her (and are also in the opera Carmen) including race, social class, and feminism, particularly in her album B’Day (2006), her song “Single Ladies” (2010), and her opera-like “visual album” Lemonade (2016). Like the character Carmen, Beyoncé’s public persona seduces fans through her alluring voice, dance, and sexuality, as well as simultaneously portraying a strong, successful, fierce, independent woman who addresses issues of racial tensions, gender inequity, and social class divide through her immensely popular music. Now that Queen B has a few decades of musical savvy and pop-stardom under her belt, perhaps she would consider revisiting Bizet’s masterpiece and creating a brand-new hip-hopera—one where Carmen’s emotional complexities and present-day struggles are brought to life afresh. If so, perhaps her 2016 single “Sorry” would serve as Carmen’s final aria to Don José.